As the second week of Jimmy Butler’s tenure with the 76ers drew to a close, an undeniable development was unfolding. His point man, Ben Simmons, was putting up terrific numbers. During a 3-1 stretch against Charlotte, Phoenix, New Orleans, and Cleveland, the 2018 Rookie of the Year averaged 21.5 points (on 62.5% shooting), 8.5 rebounds, 8.8 assists, and 1.3 steals per game, while also notching three double-doubles. But even more to the liking of Simmons’ head coach lately has been the way the Aussie’s run the club ever since it managed to land another star-caliber player. In the days after the November 12th Butler trade went down, Brett Brown met with Simmons to discuss the importance, now more than ever, of the 2016 no. 1 pick leading the Sixers with the true mindset of a point man. Having played point guard in his formative years, including three seasons as a starter at Boston University, Brown knows the position inside and out. As a coach, he continues to think the game like a point guard, and has come to view the position as the toughest in the NBA. In Brown’s eyes, success at the point involves way more than ability. When the ball is in Simmons’ hands, he’s expected to oversee an extensive checklist. While that doesn’t make him different from his counterparts around the rest of the league league, the duties are nevertheless heavy. Time and score. Late-game situations. Being aware of the bonus. Shot selection - from feeding Joel Embiid in the post, to creating quality perimeter looks for JJ Redick and the Sixers’ other 3-point threats. Oh, and now you can add integrating another star, in Butler, to Simmons’ responsibilities. In other words, there's a lot on his plate. 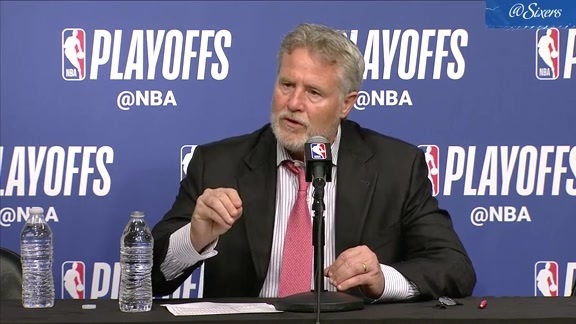 He wants Simmons “owning the gym,” recognizing exactly what to do with every ebb and flow of the game. Sometimes, the best decision might require Simmons setting up someone else, or finding new ways to affect a play. Such is especially the case when your newest running mate is Jimmy Butler, a dynamic two-way talent capable of changing games on both ends of the floor. Brown praised Simmons’ willingness to embrace sacrifice. “I think he’s been excellent,” said Brown. “I see the greatest area of improvement in that mentality, in that leadership, in the acceptance of that role. That’s where we need him the most. Through the Sixers’ seven games with Butler, Simmons has generated an individual net rating of 2.5 (116.5 offrtg / 114.0 defrtg). That’s a positive net gain of 4.5 points per 100 possessions compared to the -2.0 net rating (103.5 / 105.5) Simmons had posted prior to Butler’s arrival. To Brown, Simmons’ talents and gifts - both natural and learned - are obvious. Combine them with an even sharper tactical approach, and the potential could be generational.